In this lesson, we will learn how to identify angles as vertical or adjacent. If two angles are vertically opposite, then they have a common . The two angles 𝐴 𝑀 𝐷 and 𝐵 𝑀 𝐶 are called angles. Which of the following statements applies to the given figure? A ∠ 2 and ∠ 3 are vertical angles. B ∠ 2 and ∠ 3 are corresponding angles. C ∠ 1 and ∠ 4 are adjacent angles. D ∠ 2 and ∠ 3 are adjacent angles. E ∠ 3 and ∠ 4 are vertical angles. Determine whether the angles ∠ 2 and ∠ 5 are adjacent, vertical, or neither adjacent nor vertical. Determine whether the angles ∠ 4 and ∠ 6 are adjacent, vertical, or neither adjacent nor vertical. Determine whether the angles ∠ 3 and ∠ 4 are adjacent, vertical, or neither adjacent nor vertical. Are ∠ 1 and ∠ 2 adjacent angles? 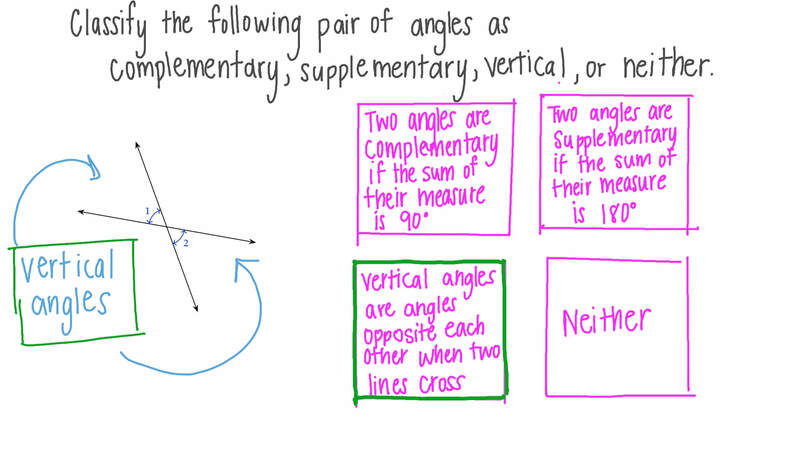 Find the sum of the two adjacent angles given in the diagram. Find the sum of the two adjacent angles from the given angles in the diagram. Find an expression for the sum of the two adjacent angles from the given angles in the diagram.